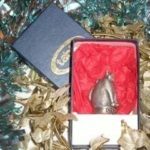 The hand crafted fat cat bottle stopper in pewter and finished by hand with paint and cork. Here kitty, kitty…..here kitty, kitty….This one keeps trying to escape from our range of stoppers. He’s a load little fella when in the box, however onces he’s out he quitens right down and get on with this job 🙂 Would you steal wine from this mad looking snail ? Would you dream of knocking it over ? We dind’t think so either which is why he’s so good at his job….stopping wine! Its designed and made in the UK, like most of the Qtable range by crafts people in solid pewter and finished with cork and painted. Its a great gift for people that appreciate quality things, not your factory produced stuff. If you have any questions please don’t hesitate to ask as we love to hear from our customers both new and old.